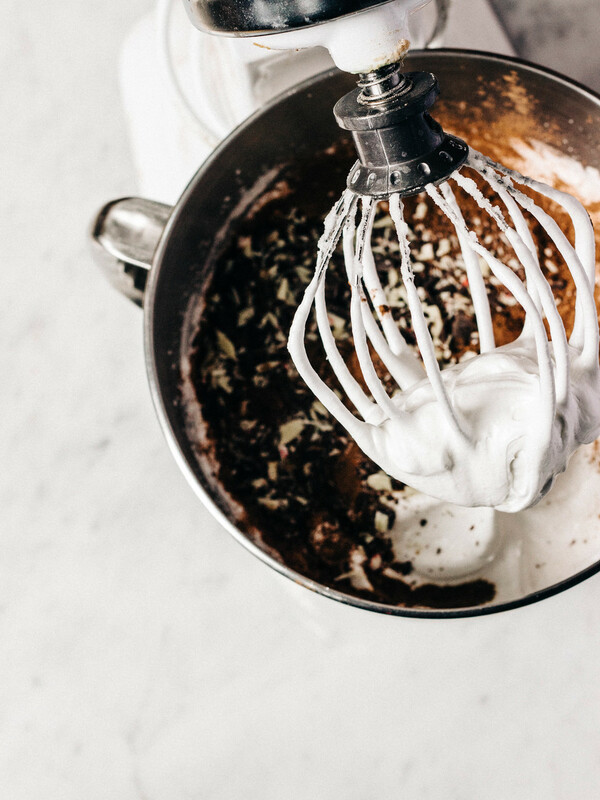 When you take Williams-Sonoma Peppermint Bark, combine it with a little more chocolate, a whole lot of egg whites, some sugar and a little vinegar you get the most delicious pavlova! Crunchy exterior, fluffy inside, and then of course, topped with a mound of soft whipped cream and finely chopped peppermint bark. 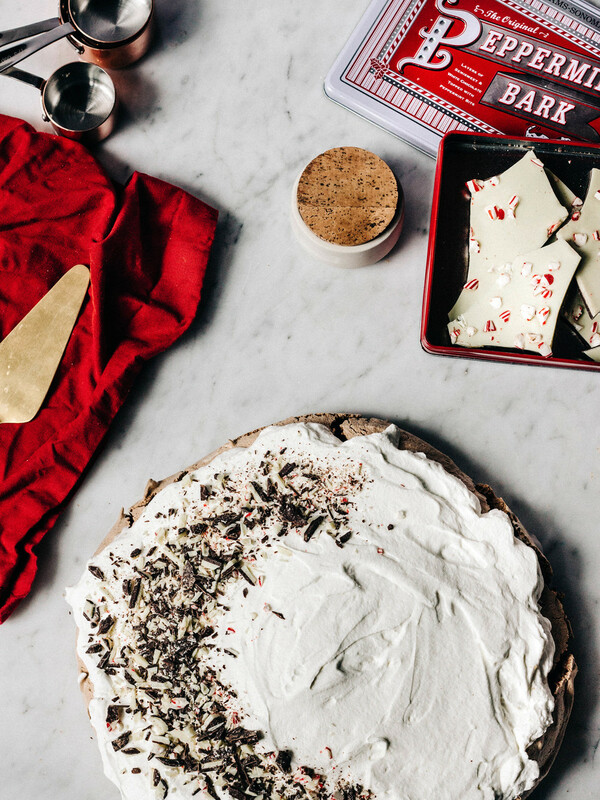 Because you can’t go wrong with adding more peppermint bark! This recipe was created in collaboration with my friends at The Feed Feed and Williams-Sonoma, featuring my most favorite holiday treat, #barkyeah! Also known as the best little gift there ever was. PS, no judgement here if you have been eating the bark for breakfast along with some coffee. And if you haven’t been, please start now, you’ll thank me later. A few notes, you can make this pavlova into one large 11” dessert. Perfect for putting in the middle of the table, where everyone grabs a fork and digs in. Otherwise, I suggest making smaller single size portions. As well, you can add a little peppermint extract to the whipped cream if you want a little something more. Or, to make this even more festive, add in a little red food coloring. Preheat the oven to 350 degrees. If making 1 large Pavlova, line one baking sheet with parchment paper. If making the mini’s, line 2 baking sheets. In the bowl of a stand mixer, beat the egg whites with the salt at high for 2 minutes, until foamy. Gradually add in the sugar a spoonful at a time and continue beating until stiff peaks form, 8-10 minutes. Sprinkle the cocoa, vinegar and the chopped peppermint bark over the egg whites. Gently fold together until mixed thoroughly. Dollop the meringue onto the parchment paper baking sheet and spread into a 10” round, smoothing the sides and the top with a spatula. Place in the oven and turn down the departure to 300 degrees and cook for 1 hours for mini’s, and 1 1/4 hours for the large. Turn off the oven and let cool in the oven until completely cool. In the mean time, whisk the cream and sugar until thick. Top the pavlova with the cream and sprinkle finely chopped peppermint bark over top.